Please tap one of photos from the photo list at the bottom of the screen. There you will see four editor options. The first option is used to arrange photo order, tap second option to delete photos, set pan&zoom effects with the third option and touch the forth option to use photo editor. 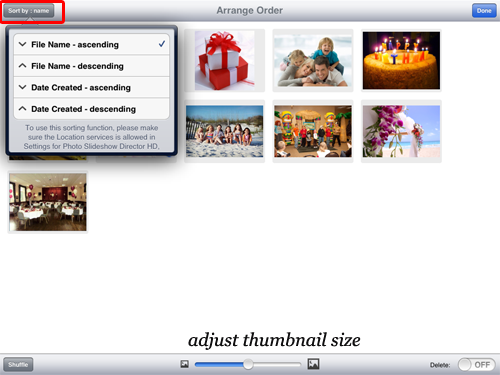 Tap corresponding option to organize photos. 2.1 Sort photo by name and date. Tap the first icon to arrange photo order. You can choose to sort photos by date or name by taping "Sort by" dropdown list. If the photo thumbnails are too small, slide the bar to adjust the thumbnails size. 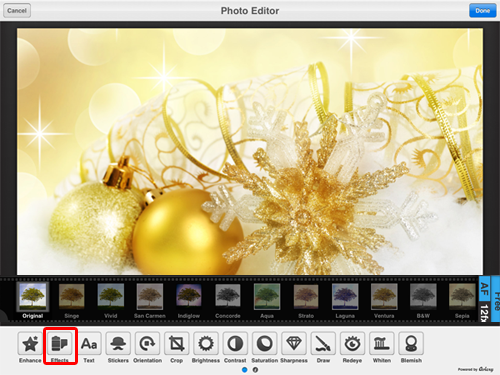 2.2 Optimize and Edit Photos with powerful photo editor. 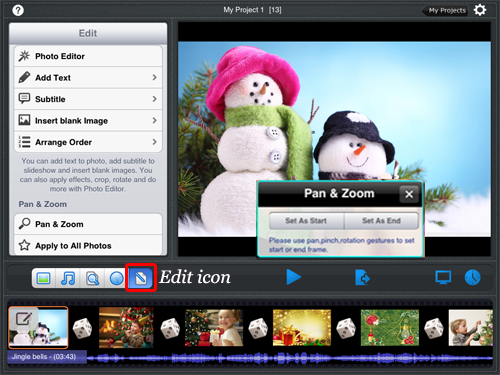 The slideshow software has a powerful photo editor which can help you fix your photos and make your photos perfect. Tap the "Effect" option, you can apply filter effects to photos. 2.3 Set pan / zoom effects for slides. Tap the last option to customize pan&zoom effects to photos. Then use pan, pinch, rotation gestures to set start and end frame. Tap "Delete" icon to delete slides you do not want to use.Also, you can tap the "Edit" icon to use Photo Editor, add text and subtitles, insert blank images, arrange photo order and set pan&zoom effects. 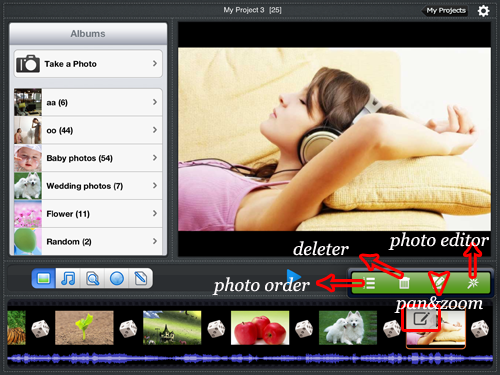 With its powerful photo editor, the app also enables you to save fixed photos to iPad Photo Library.